Enhance the beauty of your home and add a touch of elegance to any room with high quality and stylish designer curtains, blinds & soft furnishing. Silver Thread Interiors is a well established decorating store, servicing the affluent northern suburbs of Johannesburg for the past 14 years, extremely meticulous in selecting the various products that it retails. While striving to perfect a well-run organization, the owners of the family business, the NOORBHAI family, intends to transform this formidable business with vast experience into a professional & quality conscious establishment. 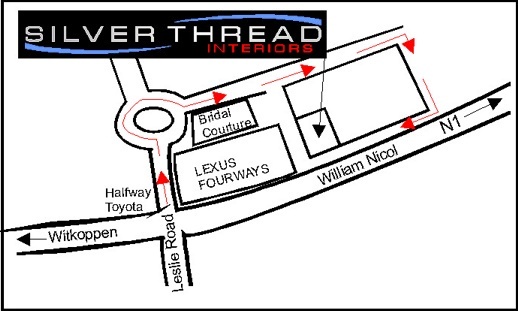 Silver Thread Interiors showroom is based in the Fourways area. The comfortable & friendly showroom boasts 12 room settings, where the home owner can view the latest products & trends. Silver Thread Interiors specializes in unique Curtain Headings & textured fabrics, innovative blind solutions, imported wallpaper including professional installation and the most luxurious bed linen & decor items. Coupled with an in-house workshop & experienced installation team, Silver Thread Interiors is able to Measure, Design, Manufacture & Install the most desirable Window Treatments for the domestic & corporate sectors.